the Faith Lutheran Church missin team at the open air cafeteria. From left are: front, Ryan Roberts, Jessica Gruhot, Delaney Roberts, Larry Roberts, Allison Brooks, Pastor June Fryman, Terri Roberts, and Kinsey Carroll; back, Heather Fryman, Roby Ruppert-James, Brian James, Cedric and Sarah (Fryman) Gegel, Jeff Fryman, and Danny Carroll. Inside the under-construction birthing center. 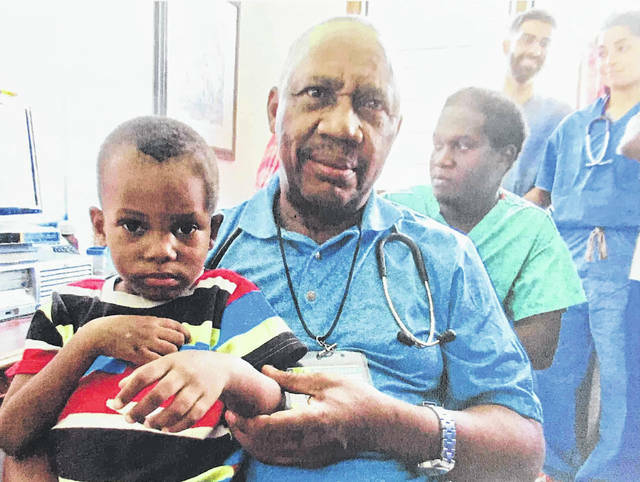 Dr. Jesse Kitundu and 4 year-old patient who came in with a broken arm; x-rays revealed he has very fragile bones like osteoporosis, and further testing revealed he has sickle cell anemia. Because he was brought to the clinic, he will continue to have follow-up care and is receiving vitamins with iron. Fifteen members of Faith Lutheran Church in Wilmington recently returned from Zinga, Tanzania after working with International Health Partners in the construction of the first Children’s Hospital in Tanzania. The outpatient day clinic began seeing patients two years ago; there is an x-ray and ultrasound building that is also seeing patients, and an open-air cafeteria is near completion, according to Faith Lutheran Church Pastor June Fryman. 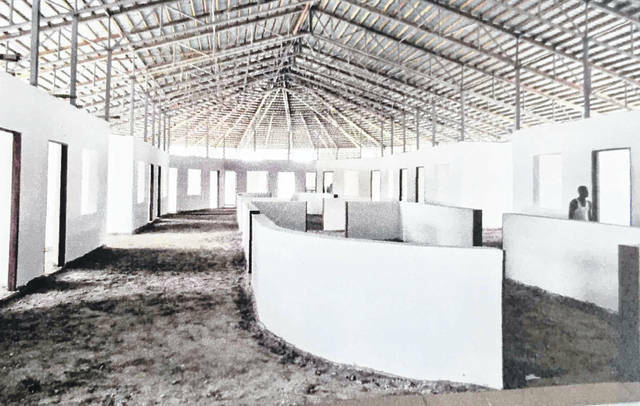 Currently, the birthing center and neonatal intensive care unit are being constructed. The vision of IHP includes the construction of 33 buildings — so there is much work yet to be done. 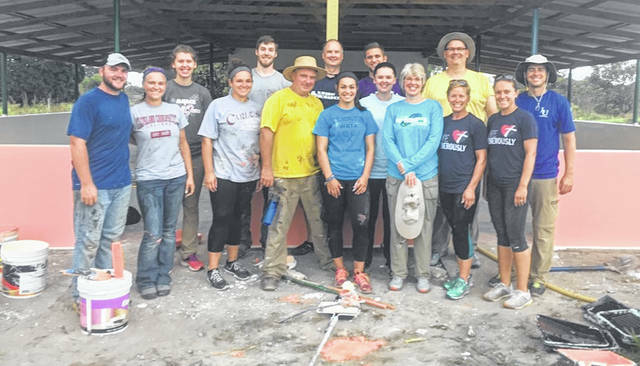 Faith Lutheran’s team of 15 worked for four days painting the outpatient clinic, the open-air cafeteria, the foundations of the outpatient clinic and the birthing center, and the missionary house, according to Pastor Fryman. The team contributed 340 labor hours in those four days — the equivalent of one person working a 40-hour week for eight weeks. “We want to thank everyone who participated in our fundraisers for our Tanzania mission trip projects,” said Pastor Fryman. “Your donations through our various fundraisers purchased paint, paint supplies, and a number of other supplies needed for the hospital. We thank everyone who attended pancake suppers, community reward dinners at restaurants — Max & Erma’s, Bob Evans, Buffalo Wild Wings, and Fiesta Vera Cruz — and all who made donations. The team’s medical missionary hosts at the hospital, Dr. Denny and Paula Lofstrom, will be visiting Faith Lutheran Church on Nov. 25. For more information on their work in Tanzania or their visit, go to www.ihptz.org or call the church office at 937-382-2460. Faith Lutheran Church is at 421 E. Vine St., Wilmington. The church’s website is www.flcwilmington.com .